The Frederick Phineas & Sandra Priest Rose Center for Earth and Space, which opened in February 2000, was heralded as the 21st century's first architectural icon and the world's most advanced educational facility devoted to astrophysics and Earth and planetary sciences. The Rose Center serves to expand the public's grasp of profound astronomical concepts such as the size, age, and origin of the universe and the evolution of galaxies, stars, and planets, presenting the latest data through technologies unimaginable until now. 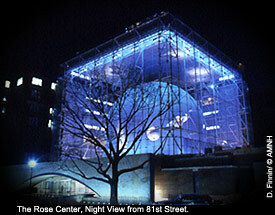 The new Hayden Planetarium is housed in the Hayden Sphere, a magnificent structure that weighs four million pounds. 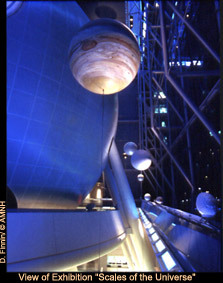 The upper hemisphere holds the Space Theater, which contains the world's largest and most powerful virtual reality simulator. The Theater offers the public, for the first time ever, a hyperrealistic view of planets, star clusters, and galaxies, in an exhilarating, continuously accelerating journey from the Earth to the "edge" of the observable universe. The Space Theater uses a customized one-of-a-kind Zeiss Mark IX Star Projector, the most advanced in the world. The Digital Dome System, capable of "flying" audiences through the digital galaxy and beyond, utilizes a powerful Silicon Graphics® Onyx2 InfiniteReality2 visual workstation and a Trimension video display system that consists of seven Prodas projectors. The Space Theater has a 38-foot-high dome and 429 seats, as well as a state-of-the-art sound system that controls the direction of space-show sounds, enhancing visitors' perceptions of moving objects and giving a sense of vibration and "lift off" at the start of the presentation. The virtual universe seen in the Hayden's Space Theater is based on actual astronomical observations and computer models of our galaxy from the National Aeronautics and Space Administration (NASA), including those from the Hubble Space Telescope. The presentation also contains data from the European Space Agency's Hipparcos database of more than 100,000 nearby stars, as well as from a statistical database of more than three billion stars developed by the Museum, with other collaborators. The National Center for Supercomputing Applications and the San Diego Supercomputing Center contributed significant computing and visualization support. For those sections of the galaxy for which there is no data, the Museum constructed statistical models that were translated into high-definition computer simulations of our galaxy and then fully rendered. Following the explosive Big Bang, visitors exit onto the Harriet and Robert Heilbrunn Cosmic Pathway, a dramatic, spiraling ramp that ushers them through 13 billion years of cosmic evolution. At the start of the walkway, children and adults alike can measure the length of their stride and determine how many millions of years pass with each step. Thirteen markers along the way denote the passage of each billion years, and at eight landings, computer interactives are available to help visitors visualize how large the universe was at that point in time. To illustrate the development of the universe, astronomical images highlight each era in which you stand. Artifacts are also on display, including evidence of the earliest bacterial life on Earth and the fossilized tooth of a giant carnivorous dinosaur. At the end of the 360-foot circular pathway, the thickness of a human hair illustrates the relative duration of human history, from cave paintings to the present. The Heilbrunn Cosmic Pathway leads visitors down into the Dorothy and Lewis B. Cullman Hall of the Universe, a 7,000-square-foot permanent exhibition hall on the lowest level of the Rose Center, underneath the Sphere. The Cullman Hall of the Universe presents the stunning discoveries of modern astrophysics, examining such questions as how the universe evolved into galaxies, stars, and planets, and how the atoms from which we are made were forged in the centers of stars. Divided into four zones, this dynamic hall draws upon cosmic forms, such as spheres, ellipses, and spirals, and features six central exhibit islands rich with astronomical imagery, kinetic models, three-dimensional visualizations, rotating video displays that resemble satellite dishes, computer interactives, and more. A major feature of the Rose Center is the Scales of the Universe exhibit along the second-floor, 400-foot-long walkway that hugs the glass wall of the cube. Using the Hayden Sphere as a basis for comparison, this unique exhibit explores the vast range of size in the cosmos-from the astounding reach of the observable universe to the size of our planet to the nucleus of the smallest atom. Along the walkway, stations introduce visitors, by increments of the power of ten, to the relative sizes of atoms, planets, stars, and galaxies, by using text panels, interactive terminals, and both large, overhead and small, rail-mounted models. 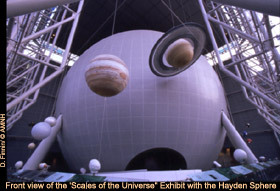 Enormous, realistically rendered planets, stars, and galaxies-including a nine-foot-diameter model of Jupiter and a model of Saturn with 17-foot-diameter rings-are suspended from the ceiling of the building. Gottesman Hall of Planet Earth focuses on how the Earth works and its geologic history. Built around rock samples and models gathered from around the world, together with state-of-the-art computer and video displays, the Gottesman Hall investigates major questions about Earth's existence and its dynamic processes. The Hall, located on the first floor, features a stunning collection of 168 samples from such locales as Mount Vesuvius, the Grand Canyon, and the Swiss Alps, along with 11 full-scale models of significant outcrops and geologic features. Towering sulfide chimneys from the Pacific Ocean floor and a strikingly beautiful red-banded iron formation that is 2.7 billion years old are some of the rare specimens found in the Hall. Satellite images projected from within a suspended eight-foot-diameter Dynamic Earth Globe create an entrancing view of the planet as seen from outer space. The electronic Earth Event Wall broadcasts reports of global events, such as earthquakes, volcanoes, and atmospheric conditions, as they occur. Touch-screen computer kiosks, located at the base of the Wall, supply further information. 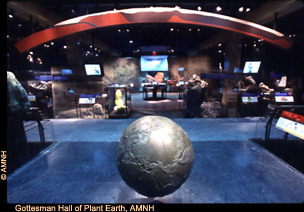 The Hall includes other features such as a touchable cast-bronze globe, an audio presentation of Earth's sounds, vibrating benches that emulate the power of Earth's eruptions and earthquakes, and a variety of videos and computer interactives. Hours: Sunday through Thursday, 10:00 a.m. to 5:45 p.m., Friday and saturday to 8:45 p.m. The Museum is closed on Thanksgiving and Christmas. Admission: A suggested admission fee allows visitors entry into the 42 permanent halls of the Museum and the new Rose Center for Earth and Space. 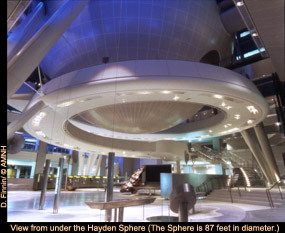 There is a separate fee for the Hayden planetarium Space Show, IMAX® films, audio expeditions, laser shows, and certain special exhibitions and programs. Entrance: The direct entrance to the Frederick Phineas & Sandra Priest Rose Center for Earth and Space is on the north side of the Museum on West 81st Street, just west of Central Park West. Access is also available through the Museum from Central Park West at 79th Street and West 77th Street between Central Park West and Columbus Avenue.